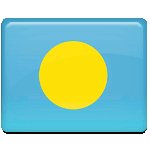 Palau is a small island country in Micronesia. The islands became a Spanish colony in the late 19th century. In 1899, Spain sold the archipelago to Germany. During the First World War, Palau was awarded to Japan as a League of Nations Mandate. After the defeat of Japan in the Second World War, the islands were administered by the United States. Palau refused to join the Federated States of Micronesia in 1979 and became a republic in 1981, following the coming into effect of the new constitution. The constitution defines Palau as a democratic presidential republic. The President of Palau is both head of state and chief executive of the national government. The first president of Palau was Haruo Remeliik. He served from 1981 until his assassination in 1985. The term of office for Palauan president is four years, it is renewable once. The only President of Palau to serve two consecutive terms is Thomas Remengesau, Jr. (from 2001 to 2009). In 2013, he was elected to another term. President's Day in Palau is an official non-working holiday, it is marked with numerous festive events held throughout the country.